Loneliness and isolation are among the biggest poverties of our time. At Vincentian Care Plus volunteers play an important role in befriending and helping people stay in touch with their friends and the community. 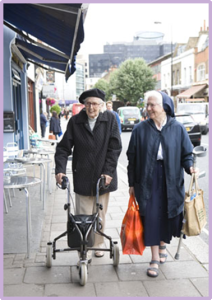 The Befriending Service of Vincentian Care Plus is the PLUS of our service! We offer our service users the opportunity to have a befriender, should they wish. Our befrienders are drawn from our pool of volunteers and are trained to offer social and friendly support to the service users, taking their lead from the service Users wishes in order to provide conversation and support with hobbies, activities and interests. We are always looking for people who wish to volunteer for a few hours a week in the befriending wing of the service. Click here to download our Volunteer Application form which can then be emailed back to the above email address.